Summer has ended, and fall has arrived with all of its glory. It’s time to rejoice, dig into that storage closet, and start pulling out all your Halloween junk that’s been sitting around all year. The season of pumpkins, turkeys, and Christmas trees has arrived, and you no doubt have seasonal decorating plans. However, as professional cleaners, we can attest to the fact that Halloween is a messy holiday. A very messy holiday. It’s hard to think of any holiday that causes more disastrous messes than Halloween does, and nobody likes staying awake after the festivities to meticulously clean a mess that could have been easily avoided. Here are some of the most common Halloween-related cleaning disasters that we see every year, and some ways to avoid them. What kind of person goes through all of Halloween season without carving a pumpkin? Somebody who’s missing out on life, that’s who. But everyone who has carved a pumpkin knows just how messy it can be — and for the uninitiated, it’s often an unexpected surprise. While there are more difficult things in the world to clean up than pumpkin guts, you’re still not going to be jumping for joy if a big glob of it falls onto your carpet. It’s icky, it’s sticky, and most people just want to get rid of it as soon as possible. The best approach to pumpkin carving is to just assume that a mess is going to happen, and prepare for it. Avoid carving pumpkins anywhere near the carpet for starters — pumpkin goop is much easier to clean off a hard floor. Secondly, it can be helpful to use a tablecloth that’s easily disposable or washable. That way, you don’t even need to worry about getting your table dirty. Another alternative is to do it outside! Pumpkin guts are biodegradable and you’re not doing anyone any harm if some of them fall on the grass. And, as a plus, you’ll be able to feel that crisp autumn Maryland air. We’re not talking about real spider webs, and if you’ve got a problem with those, you’re probably better off reading a blog from a pest control company. No, we’re talking about those fake spider webs — you know the ones, those fuzzy stringy things that you can find at any party store. These decorations are a fun addition to any Halloween decor and are a quick way to add spooky ambiance to just about any setting. Be aware though — if you stretch fake webs too much, they have a tendency to unravel a little too much and they might end up getting everywhere. The key word here is restraint. It can be tempting to get all the mileage you possibly can out of your fake webs, but if you pull and tug on it too much, the strands will become extremely fine and they will start leaving traces of themselves everywhere you place them. When fake spider web gets too unraveled it’s much more difficult to clean up. While most people abandoned silly string when they graduated to adulthood, it’s still not uncommon for it to appear at Halloween parties or in makeshift haunted houses. We’re not quite sure what silly string is supposed to evoke. Guts? Goo? We don’t really know, but it’s often used as a decoration, and perhaps you’ve used it too. Silly string is also ubiquitous on Halloween as a prankster’s tool. Pranks are common on Halloween night, and silly-stringing somebody’s home or property is one of the most prevalent. Unfortunately, silly string can have its consequences. When cleaned up immediately it’s mostly harmless, but it can leave behind a sticky residue that’s particularly irksome for certain surfaces, particularly brick, stone, and rugs. We’ve had to lend our professional cleaning services to people who couldn’t get silly string residue out on their own. The best policy with silly string is to clean it up right away. Don’t wait around or it might start to settle! It’s extremely easy to clean up when it’s fresh, and nobody likes walking around with silly string stuck to them anyway. Another good tactic is to forbid silly string in certain areas. In general, it should be saved for outdoor use because there’s no way to tell where silly string will be blasted in your home — it’s entirely possible that you may think you’ve cleaned all of it, only to find some left over in an obscure spot days later. It’s easiest just to keep it out of your home entirely. When outside, avoid using silly string near concrete, stone, or wood. For whatever reason, silly string loves bonding to these surfaces, and you’d be surprised how hard it is to get out, even when you’re smothering it with hot water and soap. We dare you to find one person in America who hasn’t been to some kind of party or event where there was a dry ice punch bowl. Indeed, this is a universal favorite for Halloween celebrations, as the dry ice creates a wispy, smoky effect that evokes the image of a witch’s cauldron. It’s not hard to see why it’s so popular — unfortunately, it’s also not hard to see why it ends up causing so many messes every year. We don’t need to tell you why a giant bowl of spilled punch would be a disaster for your carpet. Unfortunately, many people who do the dry ice punch bowl do it because it’s a fun novelty, and for a lot of folks, it’s the only night of the year where they make punch. We’ve seen our fair share of accidents from people who didn’t know any better, their careless oversights resulting in a giant puddle of punch on their carpet. First of all, find the right dish for your punch. That is to say, don’t use a wide bowl! Yes, big open wide bowls are pretty, but they’re hardly the best container for an oversized batch of colorful, stain-happy liquid. Luckily, you have the perfect alternative during Halloween time — a witch’s cauldron! A cauldron-shaped container is fat and tall, making it hard to tip. The other suggestion is to have your punch nowhere near the carpet, just as we’ve suggested with the other things on this list. We understand that not every apartment or home has ample space with hard floors, but you’ve gotta work with what you’ve got. If moving away from the carpet simply isn’t an option, we suggest placing a disposable plastic tablecloth underneath the table, which could potentially catch the spill if the cauldron falls. It’s not the prettiest option, but it sure beats calling a floor cleaning company! Of course, if you’re unable to fix the damage yourself in the event of a spill, we’d be happy to offer our carpet cleaning services. 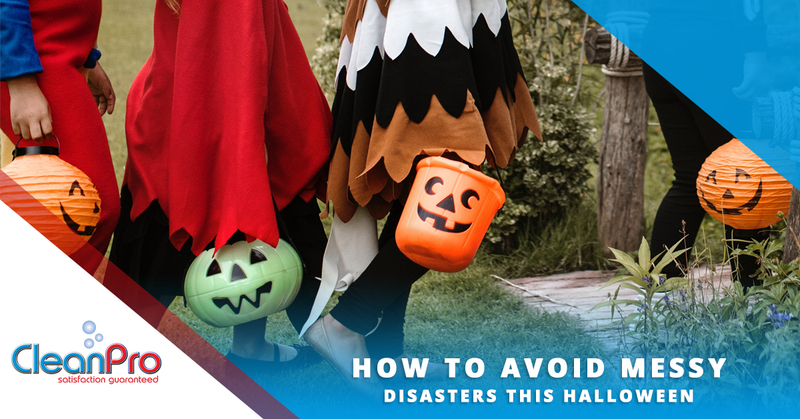 Halloween spills and disasters are the bad news. The good news is that you have a professional cleaning company nearby that is committed to providing the highest-quality service to anyone who calls. At CleanPro, LLC, we’ve served clients all over the Maryland area, particularly in Gloucester and the North Shore. We’re prepared to handle any Halloween mess that may happen this year, so if something goes wrong and you just don’t want to deal with cleaning it up, we gladly will. Our list of available cleaning services is practically endless, and our team is highly experienced. Want to ensure that your home is nice and clean after your Halloween festivities? Call CleanPro!